Matt Snowball Music stock a good range of heavy-duty stage fans for hire that are specially designed for stage and theatrical use. 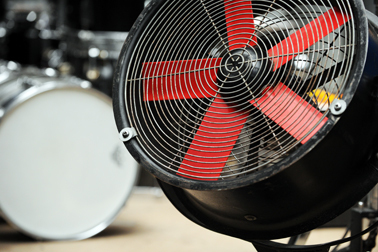 We choose Breeza stage fans for our rental stock because they are sturdily built and have durable low-noise motors that minimise acoustic disruption when you’re on stage. Each stage fan rental is supplied with a custom flight case, ready for you to head out on tour. All equipment we rent out is kept in top condition by an experienced in-house team in London. We regularly service all stock, that way you can be confident it’s in perfect condition before you take to the stage.